STRANGEL AIR is an open air festival, a fantastic space where electro sound and live sound, new wave, synth-pop and techno rhythms will meet. Romance of a big city is concentrated in defenseless melodies and futuristic synths pulsations. All hopes, dreams, emotions and other human basics will be portrayed against the background of soulless digital streams and megapolis’s concrete constructions. The most live electronic music in a picturesque place near the centre of Moscow! 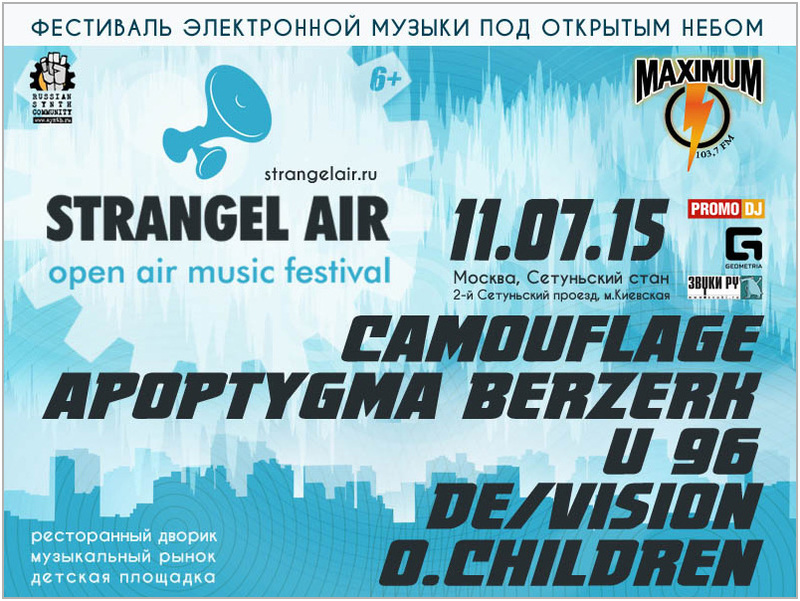 Strangel Air is the first open air festival in Russia of this kind. The leading European synth-pop bands Сamouflage and De/Vision will perform during one day. Their romantic palette will be diluted by swift bits of the legendary U96 and electro-rock-hymns of Norwegian Apoptygma Berzerk! Setun camp is a reconstructed princely settlement of the 12th century. Nowdays it is a stuntmen training base. The square around the stage is studded with the remains of old military equipment and retro cars which are often used for filming in famous movies and TV. The territory itself is a frequent background for shooting different musical videos, TV programs and telecasts of federal TV channels “1”, “Russia”, “NTV”, “TVC” and others. There is also a children’s playground. During the festival there will be opened a food court with versatile food and beverages and musical market.